Notes: While TV’s share of adults’ daily media time has shrunk slightly in the past couple of years, the medium continues to pull in a disproportionately high share of ad spending, according to new eMarketer estimates. This year, TV is expected to account for 36.4% of adults’ daily major media time, while raking in slightly more than 40% of media ad dollars. And while consumption of – and ad spending on – digital video has been rising quickly, digital is expected to pull in just 4.4% of ad spend versus its 10.9% share of adults’ media consumption this year. The disparity may be related to the greater perceived influence of TV advertising; eMarketer attributes TV’s continued strength as part inertia and part concern from advertisers over digital video ad viewability and completion rates. After spending a couple months in Swiss robot prison, the Random Darknet Shopper (RDS) is once again free to purchase random goods from the deepest corners of the Internet. The robot, originally designed as an art installation, was built to navigate the Darknet and autonomously purchase goods using Bitcoin currency. During its three-month run at Kunst Halle St Gallen art gallery in St. Gallen, Switzerland, the Shopper made a variety of purchases, most of which were completely legal. It did, however, also purchase 10 tabs of ecstasy from online retailer Agora, which is what instigated the authorities to step in. The cops confiscated the machine and the Molly. They also threatened the RDS’ creators with legal action. However, a panel of judges ruled in favor of the artists, known as the Mediengruppe Bitnik. Millennials have made smartphones a totem of their generation. Even as smartphone penetration climbs among older consumers, millennials are the ones making the most of the device’s capabilities. It is increasingly common to see millennials with smartphone in hand as they navigate a store, or using it to conduct research before getting there. Learning! what su its them and what does not, they have integrated the phone into some aspects of their shopping while (so far) omitting it from others. Shoppers want retailers to provide a personalized experience across channels, and November 2014 research by IPG Media Lab and Yahoo found that personalized ads boosted brand favorability and purchase intent among the more than 5,000 US internet users ages 16 and older polled. Location-based ads were the most effective at improving brand favorability; 55% of respondents exposed to such placements were favorable to the brand. Across all ad types studied by IPG and Yahoo, including those based on social media sites accessed! , search activity and past purchases, at least half of respondents said personalization made them think more positively about a brand, vs. 46% who said the same about standard ads with no personalization. Meanwhile, ads based on social media sites accessed had the biggest influence on purchase intent, with just under half of respondents saying so. Around four in 10 said the same about location, search and past purchase ads, compared with 36% who said standard placements lifted intent to buy. Results from December 2014 polling by the e-tailing group for MyBuys support the idea that personalized ads boost intent to purchase. Fully 52% of US digital buyers said they were more likely to engage or purchase from a new brand when they saw online ads for products they were interested in based on browsing or buying behavior, and just under half (49%) said they bought more from retailers that personalized online ads promoting offers and products from websites they visited. One-third said they bought more from retailers that served such ads on social. Digital media—and especially mobile—is gaining an increasing share of total ad spending in Canada, according to eMarketer’s latest estimates of ad spending around the world. More than one in three ad dollars in Canada will go toward digital media buys this year, eMarketer projects, and over one in 10 ad dollars will go specifically toward mobile. Overall, eMarketer expects the paid media market in Canada to increase by 5.0% in 2015. Digital ads will grow at three times that pace, and mobile ads at 13 times that pace. Outdoor will be the only other medium to increase faster than the average, with radio, TV and print all set to lose share due to slower-than-average growth. Search dominates the digital ad market in Canada, accounti! ng for a forecast 53.5% of all spending this year. That share is down slightly and will continue to drop slowly throughout our forecast period, though search will maintain a majority of digital ad spending. Classifieds will also see a slight drop in share. Display, meanwhile, will gain market share, while email holds steady. Linear TV has been on an amazing 50-year run. Internet TV is starting to grow. Clearly over the next 20 years Internet TV is going to replace linear TV. And so I think everyone is scrambling to figure out how do they do great apps, how do they things like “Noggin” which are fantastic. That will just keep getting built up and so it’s a transition into figuring out the Internet. And the way people do that is to get involved with us, with our competitors to try to start to learn what are the new patterns and modalities because Internet TV is the way that people will consume video in the future. It’s this type of cord-cutting that is really hitting cable TV companies. 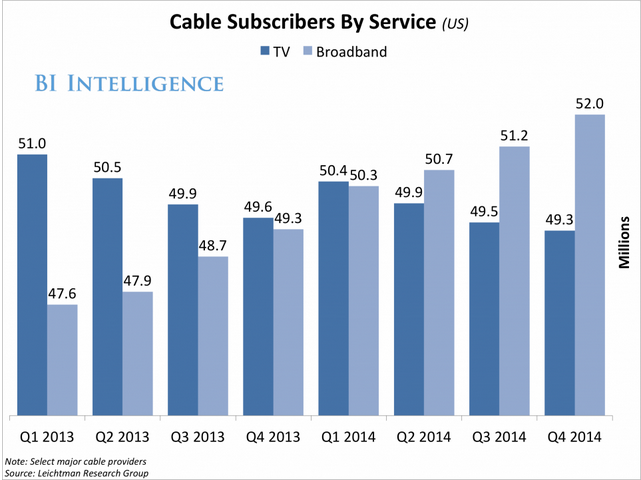 You only need to look at this chart below from Business Insider Intelligence taken from data from top cable operators in the US, which compares the rise of broadband subscriptions versus the decline in TV subscriptions, to see which way the direction of travel is going. The average Netflix user streams movies and programs for two hours a day, according to estimates from Rich Greenfield, an analyst at BTIG Research. Not only is that mean average domestic number up around 18 minutes per subscriber per day on BTIG’s last estimates, but it is a major benchmark that suggests Netflix is really eating traditional TV’s dinner. If you compare that number to traditional, live TV viewing, where the average American sits in front of the box for around 5 hours every day, according to Nielsen, that might not seem like a huge dent. 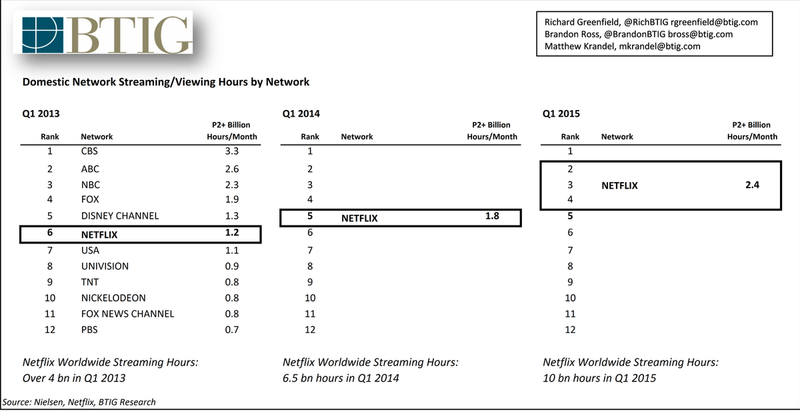 @pkafka @nichcarlson @RichBTIG Yes, but Netflix 2 hrs is on one network (Netflix) versus 5 hours on ALL TV networks. Staggering. In fact, BTIG says that were Netflix a domestic US broadcast network, it would sit somewhere between the number one and two most-watched network. B2B vendor websites are often lacking the content elements buyers perceive as most important, according to a report [pdf] from KoMarketing, Huff Industrial Marketing and BuyerZone. As with last year’s survey, the results suggest that vendors sometimes miss the basic information that can help establish credibility and move a buyer to request a quote. According to the study, thorough contact information is by far the most important asset on a vendor website to establish credibility with buyers. 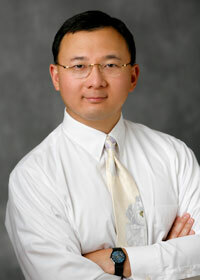 Research reports, about information/team bios, and case studies/white papers and! article s are also important, though not to the same extent. Notes: Advertisers running video ads on social media are more interested in metrics such as engagement with interactive elements (47% choosing as a top-3) and shares (43%) than they are with views (34%), according to a Mixpo survey of 125 US agency, brand and publisher executives, almost all of whom had run a social advertising campaign. The survey also finds that while more advertisers ran video ad campaigns on YouTube (77.8%) than on Facebook (63%) last year, this year more plan to run a campaign on Facebook (87%) than on YouTube (81.5%).